Apologetics Press - Did Saul Know David Prior to Goliath's Death? Did Saul Know David Prior to Goliath's Death? Following the account of Samuel’s visit to Bethlehem to anoint David as the future king of Israel, the book of 1 Samuel indicates that David became the harp player and armor bearer for King Saul (16:14-23). Subsequent to this information, the reader is told of David’s magnificent triumph over Goliath (1 Samuel 17), which then is followed by an “interrogation” by King Saul, who asked David, “Whose son are you, young man?” (17:58). A general reading through the text of 1 Samuel 16-17 has led some Bible believers to question why Saul (it seems) knew David, then did not know David, and then got to know him again. Skeptics, likewise, have inquired about the consistency of this story (see Morgan, 2003; Wells, 2001; “Inerrancy,” n.d.). Paul Tobin, in an article titled “Internal Contradictions in the Bible,” summed up the skeptic’s argument by stating that 1 Samuel 16 “clearly shows that David…was known to Saul. Yet a little later, after David’s fight with Goliath, Saul is made to enquire from his chief captain as to the identity of the giant slayer (I Samuel 17:56). And he is again made to inquire from David who he is, when he should have known this all along” (2000). Allegedly, the Bible’s portrayal of Saul’s ignorance of David after Goliath’s death is proof of the Bible writers’ imperfection when penning the Scriptures. First of all, it is imperative for one to recognize that, as with other Bible passages, nowhere in 1 Samuel 16-17 are we told that all of these events occurred in chronological order. Although throughout 1 Samuel, there is a general, sequential progression, such does not demand that every event recorded in the book must be laid out chronologically. In fact, within chapter 17 there is evidence that this is not the case. For example, the events recorded in 17:54 (i.e., David putting his armor in his tent, and taking the head of Goliath to Jerusalem) postdate the conversations mentioned in verses 55-58 (as verse 57 makes clear). More precisely, verses 55-56 synchronize with verse 40, while verses 57-58 could be placed immediately following verse 51 (Youngblood, 1992, 3:703). And, regarding chapter 16, who can say for certain that David was not already playing the harp for Saul before Samuel anointed him? First Samuel 17:15 indicates that “David occasionally went and returned from Saul to feed his father’s sheep at Bethlehem.” Perhaps it was during one of these furloughs that he was anointed as the future king of Israel (16:1-13). Unless the text clearly distinguishes one event as occurring before or after another, a person cannot conclude for certain the exact chronology of those events. Just because one historical event recorded in the Bible precedes another, does not mean that it could not have occurred at a later time (or vice versa). Truly, the ancients were not as concerned about chronology as is the average person in twenty-first-century America. Aside from the fact that one cannot be certain about the exact sequence of events recorded in 1 Samuel 16-17, several possible explanations exist as to why Saul appeared not to recognize David after his triumphal victory over Goliath. First, enough time could have lapsed so that David’s appearance changed significantly since the last time he appeared before king Saul. William M. Thomson, a missionary in Syria and Palestine for nearly half of the nineteenth century, once described the sudden changes in the physical development of Eastern youths in his book titled The Land and the Book. They not only spring into full-grown manhood as if by magic, but all their former beauty disappears; their complexion becomes dark; their features hard and angular, and the whole expression of countenance stern and even disagreeable. I have often been accosted by such persons, formerly intimate acquaintances, but who had suddenly grown entirely out of my knowledge, nor could I without difficulty recognize them (1859, 2:366). Few would deny that young men can change quickly over a relatively short period of time. Facial hair, increased height and weight, larger, more defined muscles, darker skin, a deeper voice, as well as the wearing of different apparel, may all factor into why a person may say to someone that he or she knows, but has not seen for some time, “I hardly recognized you. 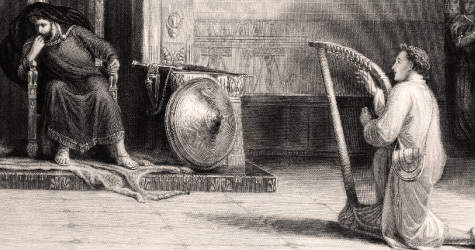 You’ve changed.” Surely, it is more than possible that between the time David served Saul as a harpist, and the time he slew Goliath, he could have experienced many physical changes that prevented a “distressed” king from recognizing his former harpist. A second reason Saul might have failed to recognize David is because he may have lapsed into another unreliable mental state. Saul’s intermittent deviation from normalcy is seen throughout the book of 1 Samuel (cf. 16:14-23; 18:9-12; 19:22-24; 22:6-19), and it is possible 17:54-58 is another illusion to his defective rationale. In his discussion of 1 Samuel 17, biblical commentator Robert Jamieson mentioned this possibility saying, “The king’s moody temper, not to say frequent fits of insanity, would alone be sufficient to explain the circumstance of his not recognizing a youth who, during the time of his mental aberration, had been much near him, trying to soothe his distempered soul” (Jamieson, 1997). Third, it could be that Saul did, in fact, remember David, but because of jealousy over David’s momentous victory (cf. 1 Samuel 18:8-11), and perhaps of hearing that Samuel had been to Bethlehem to anoint him as the next king (1 Samuel 16:1-13), Saul simply wanted to act like he did not know David. Such a scenario is not difficult to envision. Today, a teacher or coach might inquire about a student whom he or she already knows, yet in hopes of instilling more submission into the arrogant teen, the faculty member acts somewhat aloof. One textual indication that such may be the explanation of 1 Samuel 17:54-58 is that Saul still referred to David, the bear-killing, lion-slaying, Goliath-demolisher, as a “stripling” (Hebrew `elem—17:56, ASV) and “young man” (Hebrew na`ar—17:55,58). Although these two words do not necessarily carry a belittling connotation, neither designation seems very appropriate for a man who had just tried on the armor of King Saul—a man once described as “shoulders upward…taller than any of the people” (1 Samuel 9:2)—and had just killed one of the fiercest enemies of Israel. Truly, Saul’s supposed ignorance of David and his family may well have been a “performance” instigated by, what physician Herman van Praag once called, “haughtiness fed by envy” (1986, 35:421). Finally, one must realize that the text does not even actually say that Saul did not know David. It only records that Saul asked, “Whose son is this youth?” (1 Samuel 17:55; cf. vss. 56,58). It is an assumption to conclude that Saul did not recognize David. The king simply could have been inquiring about David’s family. Since Saul had promised to reward the man who killed Goliath by giving “his father’s house exemption from taxes in Israel” (17:25), Saul might have been questioning David in order to ensure the identity of David’s family. Furthermore, 18:1 seems to presuppose an extended conversation between the two, which would imply that Saul wanted even more information than just the name of David’s father. Every document, apparently ancient, coming from the proper repository or custody, and bearing on its face no evident marks of forgery, the law presumes to be genuine, and devolves on the opposing party the burden of proving it to be otherwise (1995, p. 16, emp. added). Until skeptics logically negate the above possible solutions to the questions surrounding 1 Samuel 16-17, and are able to prove beyond doubt that the Bible writer made a genuine mistake, one does not have to doubt the integrity of the biblical text. “Inerrancy: Where Conservative Christianity Stands or Falls,” (no date), [On-line], URL: http://users.vei.net/smijer/christianity/bunk.html. Morgan, Donald (2003), “Biblical Inconsistencies,” [On-line], URL: http://www.infidels.org/library/modern/donald_morgan/inconsistencies.shtml. Thomson, William M. (1859), The Land and the Book (New York: Harper and Brothers). Tobin, Paul N. (2000), “Internal Contradictions in the Bible,” The Rejection of Pascal’s Wager, [On-line], URL: http://www.geocities.com/paulntobin/internal.html. van Praag, Herman M. (1986), “The Downfall of King Saul: The Neurobiological Consequences of Losing Hope,” Judaism 35:421. Wells, Steve (2001), Skeptic’s Annotated Bible, [On-line], URL: http://www.Skepticsannotatedbible.com. Youngblood, Ronald F. (1992), The Expositor’s Bible Commentary—1 & 2 Samuel (Grand Rapids, MI: Zondervan).